Queen’s Day Tilt opens the Royal Court’s doors inviting passers-by to enjoy exciting battles and revelry while collecting Wilds, Free Spins and Multipliers. Moreover, you can largely benefit from the Game of Accession and increase your bankroll 2x for each win scored. Play’n GO just introduced a smaller and simpler 3×3 grid to help players score the big win of 500000 coins, so read the Queen’s Day Tilt slot review and discover everything about this innovative slot machine. Unfortunatly, we have no free play mode for Queen's Day Tilt available. Check out the screenshots below and hop right into action with one of the recommended casino sites! Take a bow before her royal majesty, but first, define will you play for fun or for real money. Surely, the Queen’s Day Tilt Free Play mode grants more than a few demo credits, so use them to work on your specific betting strategy or to learn how to win and make no real-money investment. Both gaming modes feature the Autoplay option that you can use to spin the reels for a predefined number of times without being interrupted. Thanks to the newest gameplay, there is a single payline and you will be asked to line up 2 or 3 symbols of the same kind and receive a prize according to the paytable. For this purpose, it would be possible to use the Queen Wild and thus form more winning combinations. Also, you can place bets between €0.10 and €100 per round. Shields, Knights, and other themed icons have a higher payout rating than Spades, Diamonds and other suits, so you will earn a maximum of 10x your stake for 3 of the highest-paying items. When the entire grid is completely out of any items, lucky winners will initially receive 5 Queen’s Day Tilt Free Spins and winnings multiplied by 2x. When a payline contains both HP Knights, the Win Multiplier goes up by 1. 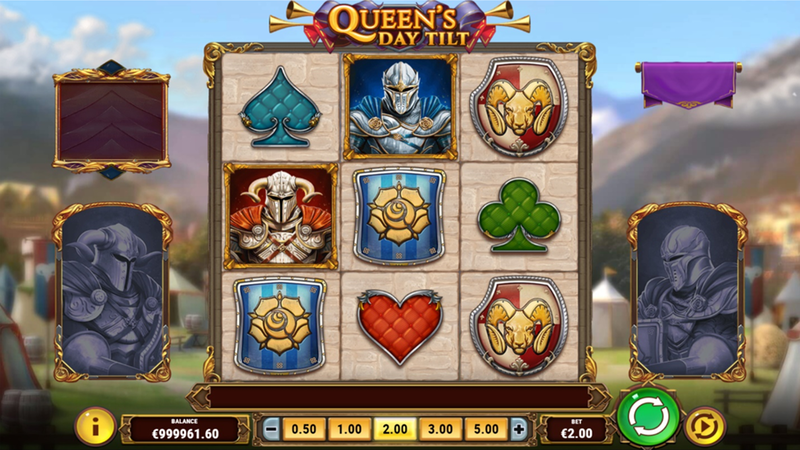 During the base game, try to score a win on both HP Knights on a single spin to activate the Queen’s Day Tilt Bonus game. You will receive 1 re-spin and get to choose between the Red or Blue Knight presuming one of them will create more winning combinations. Depending on your luck and choice, see the winnings multiplied 2x, re-start the battle or simply collect the cash prize in case your hero suffers a defeat. 3. What is the RTP factor of Queen's Day Tilt? According to the official info, the default RTP stands at 96.36%, so our Queen’s Day Tilt recension sticks to that figure. The royal battle comes with a plethora of rewarding features promising quality entertainment for a long while. With its innovative gameplay and a chance to score for at least 2 items displayed where they should stand, we can recommend it to both newbies and players with a significant gaming experience. Moreover, we suggest you take the Queen’s Day Tilt tips gathered in this tutorial to claim the throne much faster.